For a bird watcher like myself, nothing gives more pleasure than checking off another page in The Birdwatcher’s Handbook. All bird watchers have a bird of all birds, the one that got away, the white whale — that species they have waited years to see. 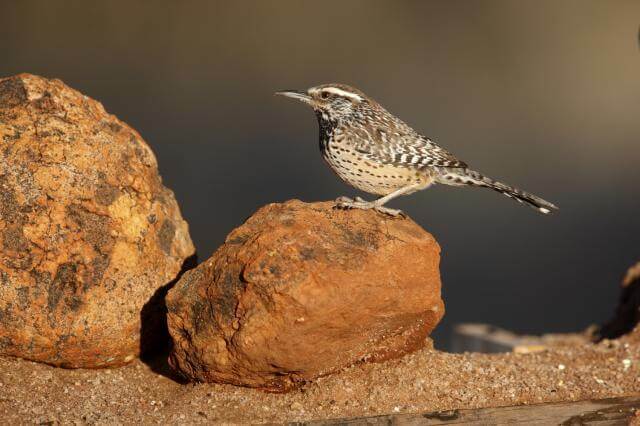 My white whale is the cactus wren, a bird native to the southwestern region of the United States and Central Mexico. A Northeast girl since birth, my heart yearns for the things I can’t have — desert heat, saguaro cactus blossoms, and flocks of cactus wrens in the lenses of my binoculars. So, this week I set out to find my bird once and for all in Marana, Arizona. Adventures ensued. Luckily, I kept a log of them for posterity. When my plane landed in Arizona, I was struck by how different the scene was from my hometown of Montpelier. The afternoon light here is brighter, the land is vaster, and the air is warmer. And so, with page nine tucked under my arm, I jumped in my rental car and drove into the pink Arizona sunset, determined to find my cactus wren. I’ve only made it to the hotel so far, and I didn’t see my bird on the way — but my vacation’s only just begun. I have faith. Marana really is for the birds, in all the best ways! Since yesterday I’ve seen countless birds, including three buff-collared nightjars, one elegant trogon, and four rufous-winged sparrows — but I have not yet spotted my wren. This morning I am exploring the Wild Burro Canyons by hiking five of the 29 miles of winding trails. The dirt and gravel paths are lined with top-heavy cacti whose skins look shiny and damp in the heat. Right now I’m sitting on my backpack in a patch of shade, peering into the saguaros, waiting. Day two in Marana came and went and still no cactus wren. But today is the day, I can feel it. Actually, today has to be the day, because I’m leaving sunny Arizona tomorrow with or without a wren sighting. This morning I am heading out to Lake Marana, a bird watcher’s paradise, according to locals. Before seeing Lake Marana for myself, it sounded like an urban legend. What kind of bird sanctuary lives on top of a sunken disc golf course? But the locals are right — “Lake” Marana is an oasis that attracts birds from all over the desert. I’m keeping my eyes peeled. Surely, surely, this must be the day? Spending hours on the edge of a makeshift lake searching for a cactus wren may not have seemed like the smartest plan of action. They are desert birds, after all, and don’t even need standing water to survive. Why would they come to Lake Marana? Somewhere in the middle of hour four, I started asking myself this question repeatedly. But before I could finish my thought — as if she’d appeared from thin air — a huge, speckled cactus wren flew down from the treeline and landed just a few yards from me! I felt like a teenager on a first date. I couldn’t move. I couldn’t breathe. I could only watch as she pecked at the ground looking for an insect or two to eat for lunch. There you are, I thought. I knew you would find me. I want to see another one! The good news? I’m staying in Marana for a few extra days. The bad news? The cactus wrens did me in. I saw just one more in the next two hours, another female. But I think I scared her, because she didn’t land — she had barely touched down before she spread her wings and launched herself into the summer air again. I don’t know what got into me, but I wasn’t ready to say goodbye to the one bird I have waited my whole life to see. I hadn’t even have time to get pictures! So I ran. I ran after that cactus wren as if I could actually keep up with her. As if I, too, had wings and could soar high into the trees. You can probably guess how this story ends. I’ll give you a hint: there was no soaring into the trees for me yesterday. There was, however, a fractured ankle, two bloodied knees, and one very bruised ego. Fortunately for me, FastMed Urgent Care in Marana was able to patch up everything but the bruised ego, and even that felt better after the lollipop.